We have had glorious weather: some rain, some clouds and some sun. well the sun encourages everything to bloom and grow! that is all you can see of it. Even though I cut rhubarb flowers, it keeps putting out more of them. At least, they are unusual looking. Blueberry and strawberry plants are booming with flowers. We can only hope the weather stays favorable, and the bird nets keep the pilfering in check. Last photo above is rosemary, which I see in flower around town. Such a sturdy and aromatic plant, how can one not love it? This has been one of the best tulip years I can remember. I like to think it is because I separated some of the larger ones and planted them all around the house. We have enjoyed tulips out of most every window. White lilacs open their blossoms before the lavender or purple ones do. These are my favorites, I love the sweet scent and only wish they lasted longer indoors. Categories: Uncategorized | Tags: aromatic, azalea, bloom, blossom, bluebells, blueberry, flower, herb, lilac, rhodie, rhododendron, rhubarb, Rosemary, scent, strawberry, tulip, white | Permalink. I have driven past this tree many times through the years, and finally bothered to stop and take a photo. Have seen many more shoes on this tree at various times in the past. I suppose a big wind or snowstorm could decimate the decorations, as it would with any tree in bloom. Or maybe someone just saw a pair they could not live without! Do you notice that all the shoes are paired? I’ll bet that makes it easier to get them to hang on the tree. I believe I’ve seen similar trees on other desolate roads – though this particular one gets plenty of traffic for a two-lane road. Categories: Uncategorized | Tags: bloom, desert, road, shoes, tree | Permalink. My daughter’s birthday is at the end of March. We have lived on this same property for over 30 years and always had fresh daffodils for her birthday. In 1994, Daddy brought a bouquet of daffodils from our property to our daughter, when he flew into another state to see her on her birthday. The last few years the daffodils have been blooming earlier than usual. Now, I do understand that 30 years in the spectrum of time is quite small, even the Mississippi River has changed course in the last 30 years. We have had milder winters these last few years, I wonder that global warming is a reality. Today is February 21, we have had 2 or 3 daffodils bloom on our 55 acres already. This is how I note the sunniest spots at this time of year. There are hundreds of daffodils planted on our land. They naturalize so well, I keep dividing and replanting on any sunny spot I can find. 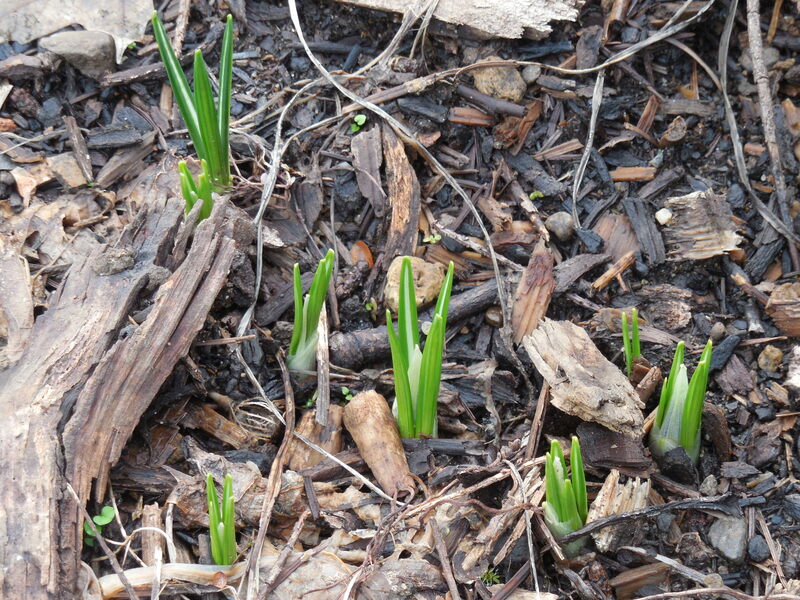 Closer to the house, near a main flowerbed, here is the progress of daffodils. Just beginning to open their petals. I took this photo when the sun peeked through the clouds for a bit today. No rain is in the forecast this next week. When sunny days are predicted, we often have foggy mornings. Depending on the amount of sun, all the daffodils may bloom this week. I see daffodils blooming along the interstate freeway (6 miles to the west), and in the nearby towns to the south. We live in the hills north of town where I have observed our flowers bloom 10 – 14 days later . Categories: Uncategorized | Tags: bloom, bouquet, daffodil, daughter, global warming, Mississippi River, naturalize, personal story | Permalink. 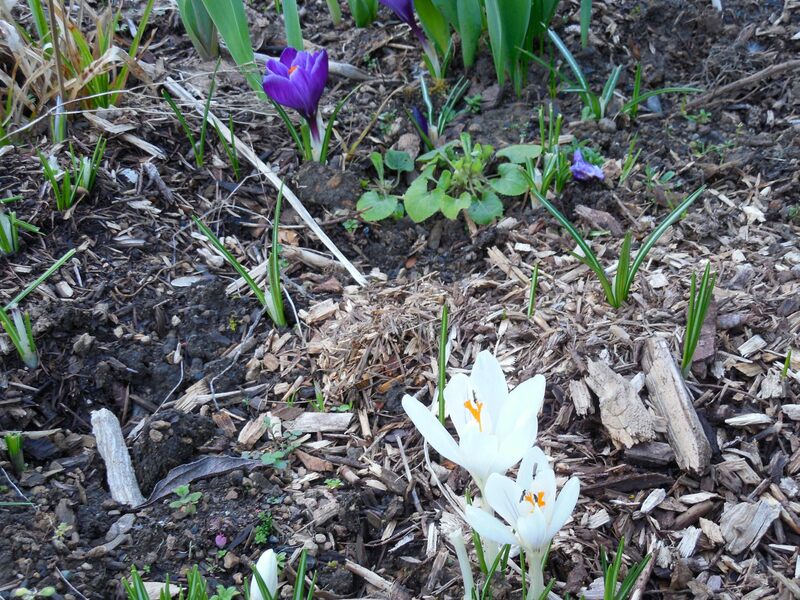 Why would only two crocus bulbs flower and all the other ones wait over a week to bloom? This is not even the sunniest location. 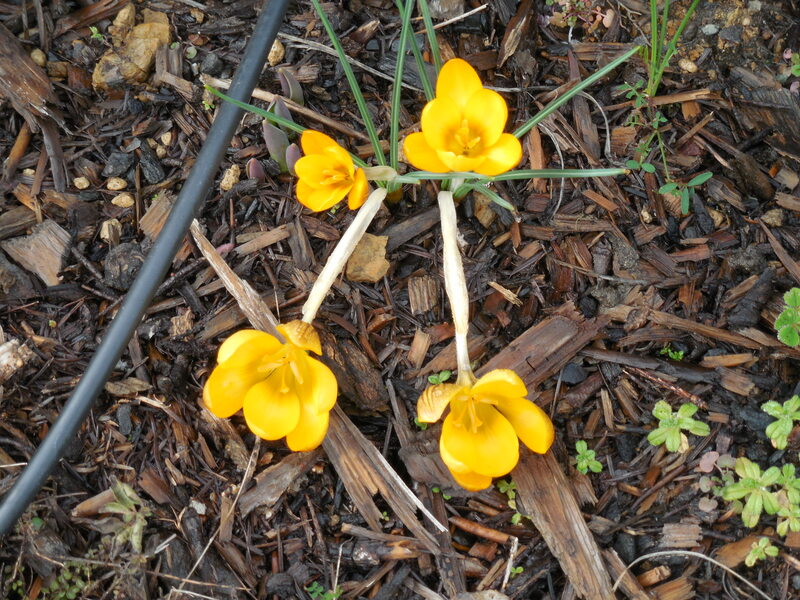 After some days of rain, the sun has encouraged more crocus to break their dormancy, and greet the winter sun. A week later, after days of rain, the sun re-emerged. These same crocuses (croci? I saw this plural someplace, did not make it up myself!) put out more blossoms. 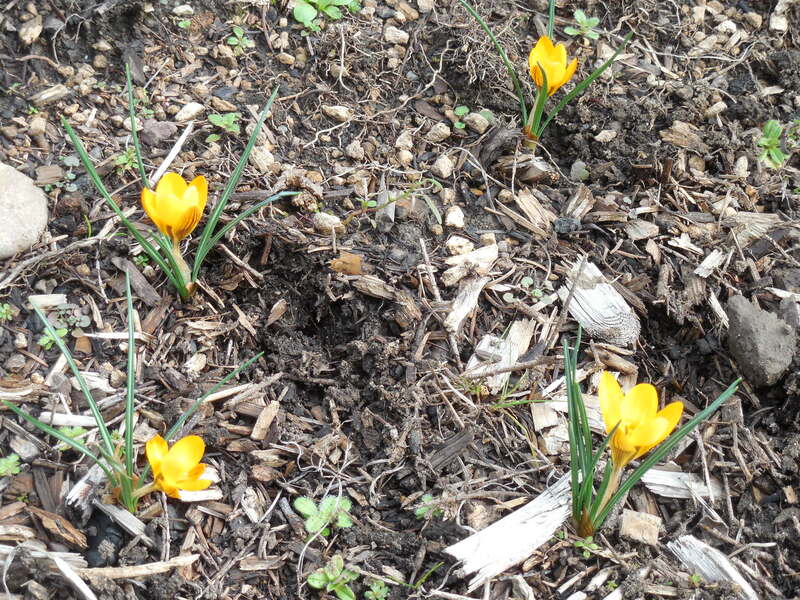 Categories: Uncategorized | Tags: bloom, blossom, bulb, croci, crocus, crocuses, dormancy, flower, winter, yellow | Permalink. 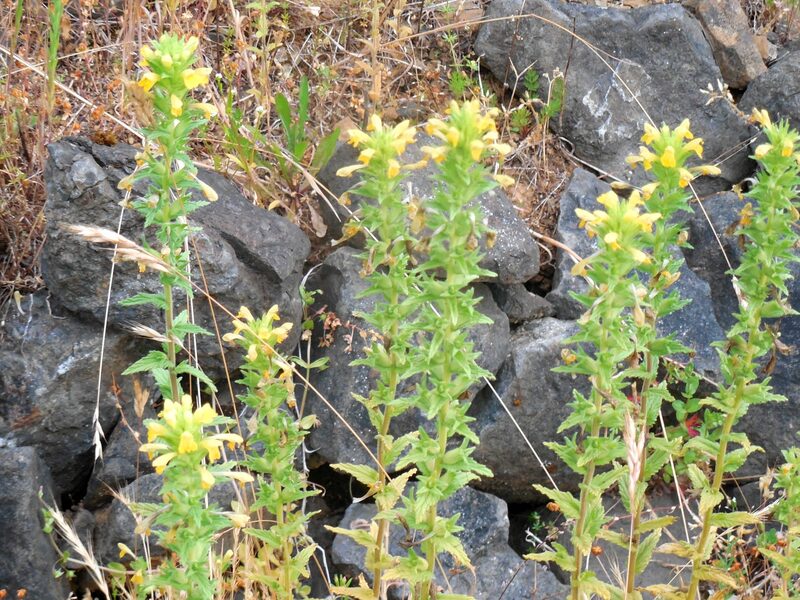 I’ve been watching these St. John’s Wort buds the last couple of days, and this morning the flowers burst open. I’ve never noticed the orange-tipped stamen before, so pretty. These wildflowers appeared a year ago at the back of a bed. Since they were in a good location, I let them stay. So far, they have stayed put, and not invaded the cultivated flowerbed. The first succulent of mine to bloom. 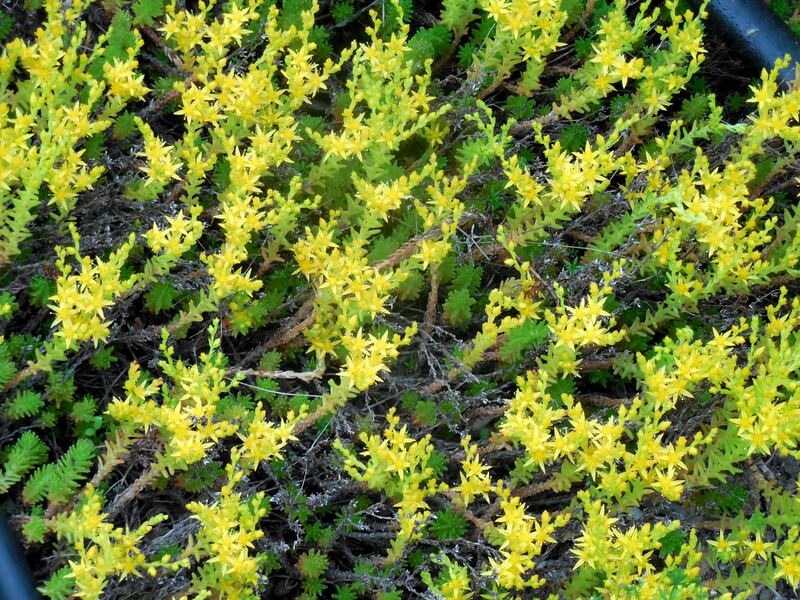 Tiny flowers on stems about 3″ (8cm). Last year, I cut a small bouquet of these blossoms and kept them through the winter, in my kitchen windowsill, as dried flowers in a mini-vase. 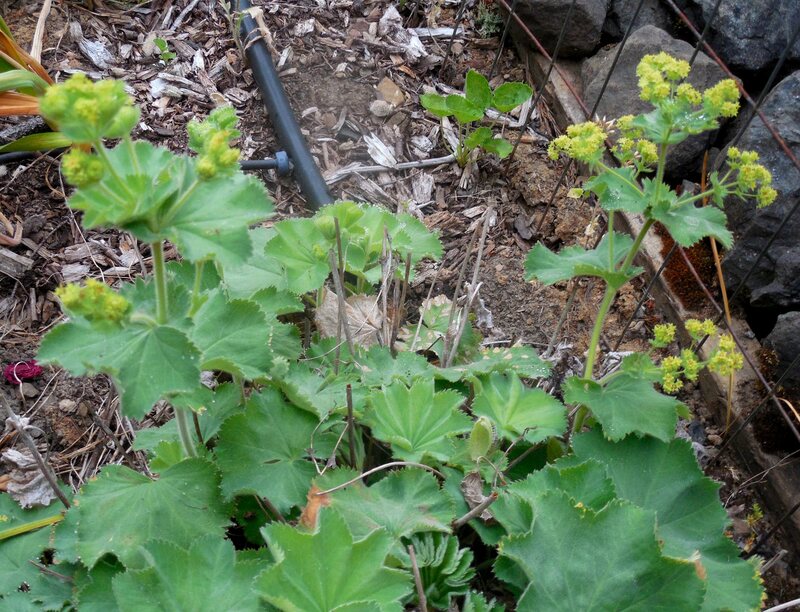 Earlier this spring, I was sure this Lady’s Mantle had died. It may have outgrown its location, so I shoveled part of the plant out. 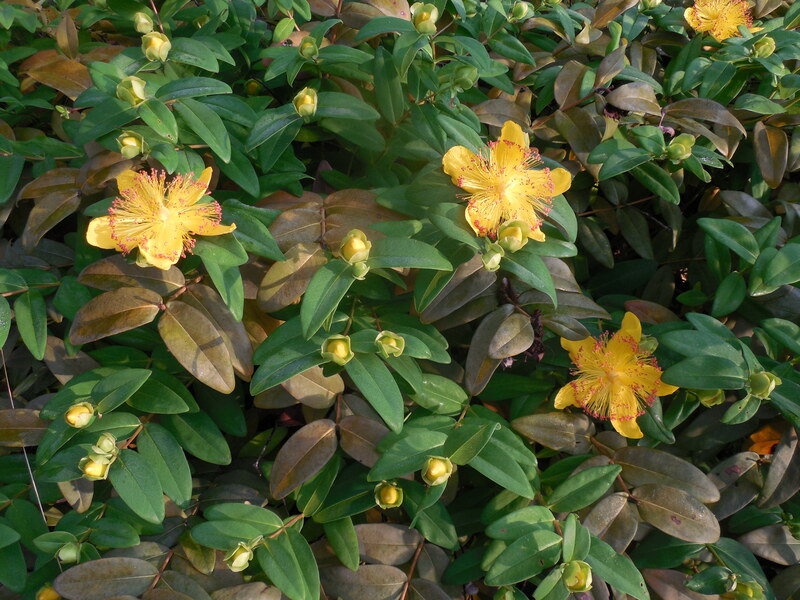 The interesting shape of its leaves and hardiness make this a keeper in my garden. 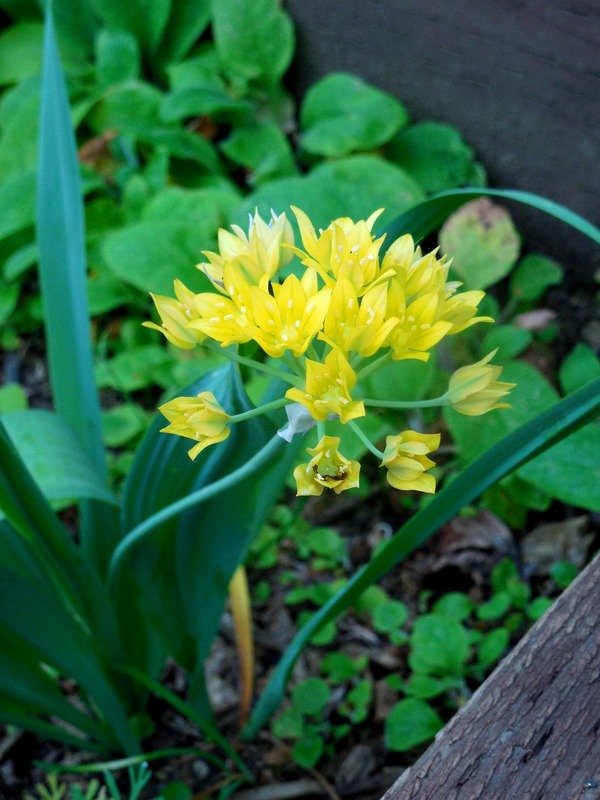 Alliums are known to be robust members of any garden, and these yellow-flowered ones do not fail. Mine have been neglected, separated and moved around by me and who-knows-what critters. 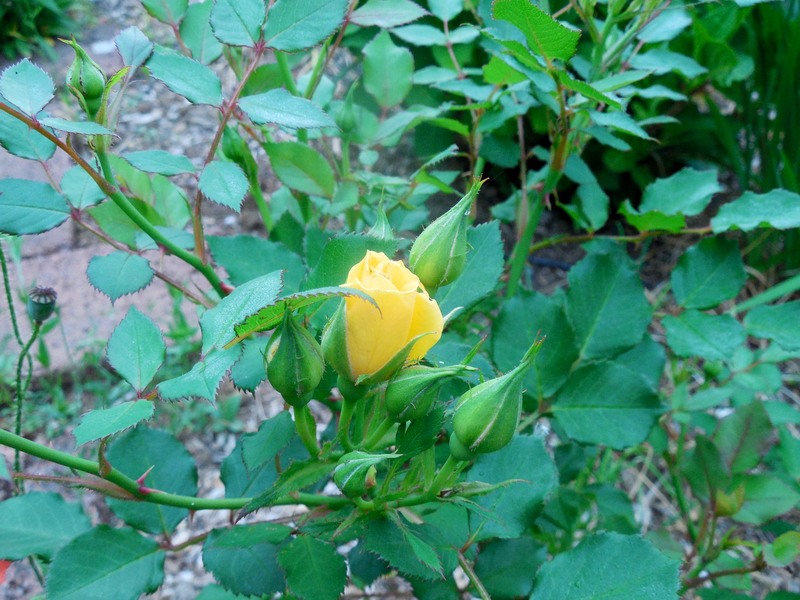 The first bud of a prolific mini-flower rose bush. You can see additional buds surrounding this blossom. I am able to cut flowers from this plant all summer long. Categories: Uncategorized | Tags: allium, bloom, blossom, critter, dried flowers, flower, Lady's Mantle, mini-rose, orange, St. John's Wort, stamen, succulent, wildflowers, yellow | Permalink. 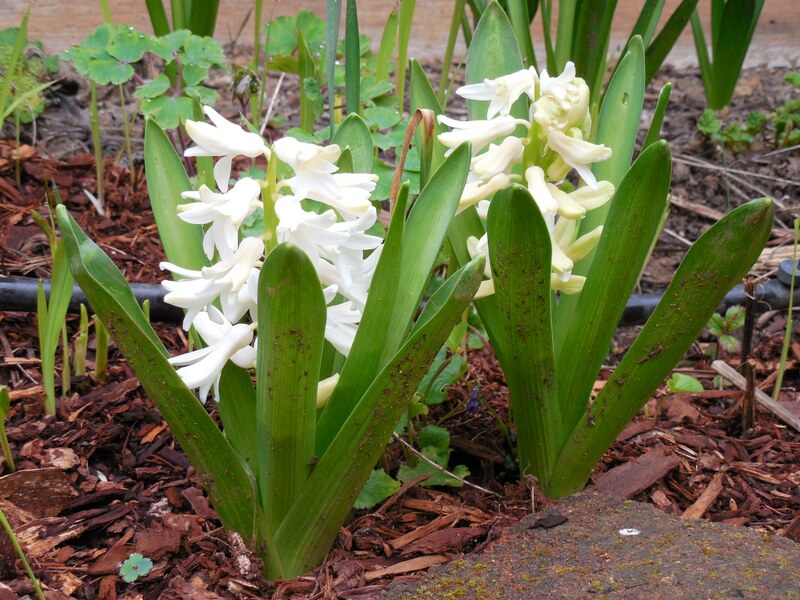 Did you know that the white hyacinth flowers before the blue or purple colored one? Or that the purple crocus blooms before the white crocus? I have been trying to figure out if the white colored specimens of a flower bloom first or later than the other colors of the same name. Here it is early in the bloom season, and I already have two different bulb flowers that give me opposite information. I can only conclude that there is no “theory of everything”. Ever since Albert Einstein, physicists have been searching for a “Theory of Everything”, and perhaps Mother Nature has been trying to tell us all along that does not exist. Categories: Uncategorized | Tags: Albert Einstein, bloom, crocus, flower, hyacinth, Mother Nature, Theory of Everything | Permalink. This flower is on the south side of my home, which is the warmest site, of course. 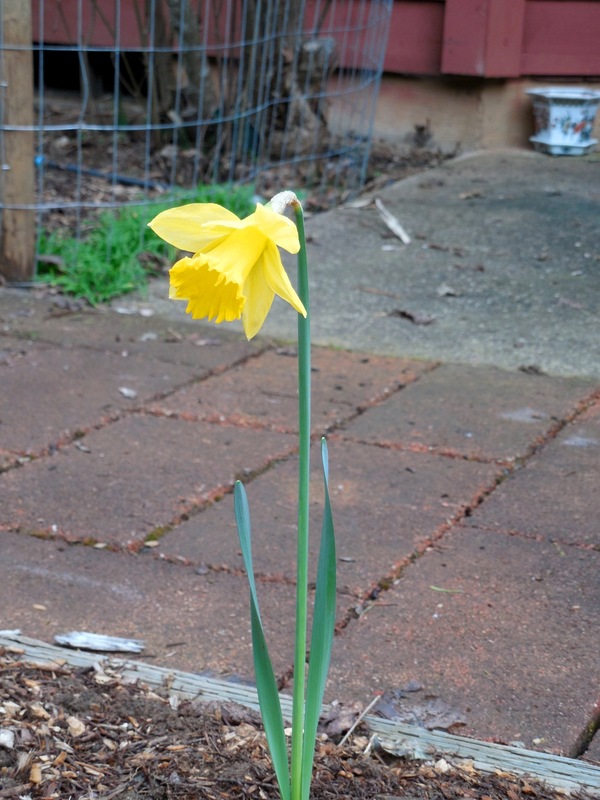 What is more interesting to me, is that just a few weeks ago, I moved and separated a number of daffodils, including this one. They had been inside a deer-proof fence, which is unnecessary for anything in the narcissus family. When I noticed the leaves emerging from the ground, there was a warmer day that I took a shovel and decided to give some daffodils a new home. The weather was cool and wet enough that they did not mind the move. Now to remember after blooming, and when the leaves have died down, to take a shovel to the daffodils that did not get moved and separated this winter. There are lots of them to be dealt with. Categories: Uncategorized | Tags: bloom, daffodil, flower, narcissus, separated | Permalink.